The present Hatchery operated by the St John's Loch Improvement Association was completed in 1995 and replaced a rather basic outdoor facility used in previous years. It is managed by a dedicated team of six volunteers drawn from the Association Membership each taking duty on a rotational weekly basis throughout the year. 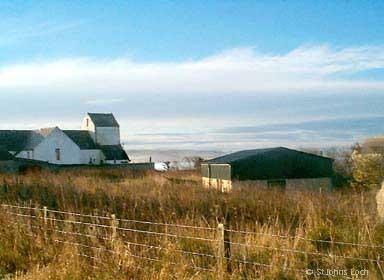 The Hatchery water supply is drawn directly from St Johns Loch, via an abstraction system installed during 2005. It passes through a large tank containing an inert biofilter medium before going on to feed four large rearing tanks, egg trays and a smaller tank which houses newly hatched fry. 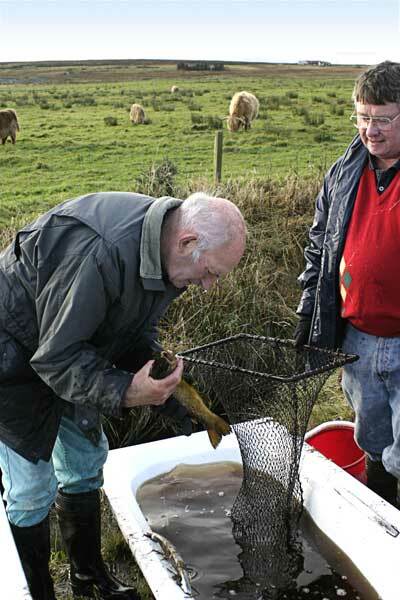 Stock for the Hatchery comes from St Johns loch in the form of Roe. Towards the end of each year, late October/November a fish trap is put in place near the loch's spawning redds. 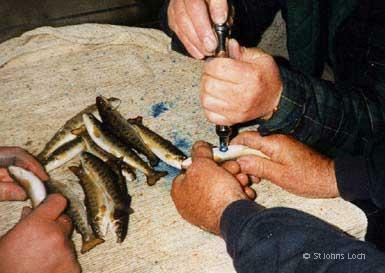 From the fish caught in the trap the best breeding pairs are chosen and the roe and milt are stripped and mixed before being carefully transported to the hatchery where they are placed in egg trays. Around 15,000 eggs are collected and these are carefully monitored in the controlled environment of the Hatchery. At this early stage the eggs are vulnerable to shock and excessive light and thus require a great degree of care and attention. They are monitored daily and any infertile eggs are quickly removed to prevent the spread of disease and keep losses to a minimum. The gestation process is dependant on water temperature but as a rule lasts for between 6 and 8 weeks. At around 6 weeks embryos will begin to develop inside the eggs. The developing trout embryo is black at this stage and, because it resembles an eye at this stage of development, it is referred to as 'eyed egg'. Around two weeks after the 'eyed eggs' have shown themselves, the eggs hatch and tiny fish called 'alevins' emerge. Attached to the stomach of the alevin is a large yolk-sac which contains protein, sugars, minerals and vitamins, everything the little fish needs to survive until it begins to feed. It takes several weeks for the alevin's mouth and eyes to fully develop and consume all of its yolk-sac. When the yolk-sac has been fully absorbed the little fish will shift from the bottom where they have been nestling, and start to swim freely. 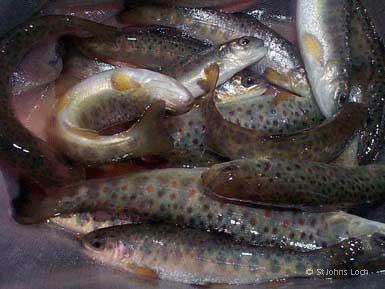 At this stage when the trout begin to swim and are ready to start eating they are called 'fry'. 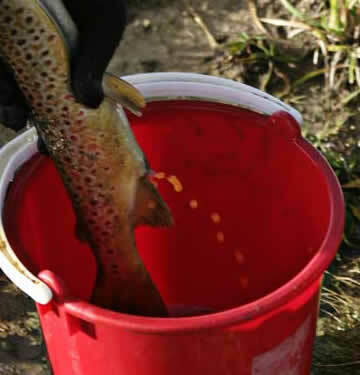 The small fry are transferred to one of the larger rearing tanks where they are fed a proprietary trout starter food. As the fry continue to grow half their number are transferred to a second of the large rearing tanks where they continue to be fed on a daily basis well into early summer. At this stage the young fish are graded and around 1,000 of the larger specimens are retained to be grown on for a further 12 months before release. Of the others, around 50% are released into the loch, while the remainder are retained until late Autumn when they too are released and the hatchery is made ready to receive its next batch of eggs. Meanwhile, the fish retained for over-wintering continue to be fed on gradually larger grades of fish pellets. As the fry grow they are divided between two of the large rearing tanks to allow room for growth. At this stage cleanliness is of paramount importance and the tanks are drained down and cleaned out on a daily basis. Should there be any sign of disease the affected fish are quickly removed and the remainder are treated with the necessary remedies to prevent the spread of infection. Prior to their release these fish are marked, on their undersides, with an indelible blue vegetable dye. This dye is harmless to both fish and humans and usually fades away completely in four to five years. Prior to handling and marking, the fish are treated with an anaesthetic to minimise stress and they appear to suffer no ill effects as a result of the process. The number and position of the dye spots can vary from year to year to assist in assessment of the growth rate of over-wintered fish. Early indications are that fish stocked at a weight between 2 and 3 ounces are being caught the following year at weights ranging from 10 to 12 ounces. The abundance of natural feeding in the loch is obvious from this remarkable growth rate. Other than Mayfly Nymphs, the loch is rich in freshwater Shrimp, Daphnia, Midge Larvae, Caddis, Snails, a variety of Olive Nymphs as well as Minnows, Sticklebacks and a myriad of other small creatures. This diet produces fish with flesh of a deep red colour and a truly exquisite flavour, making them excellent for the table.